Villa Kea is a very private newly built villa situated in the most valued area of the Island overlooking the sheltered and cultured harbor of Vourkari. It has five bedrooms and sleeps 5-8 guests. The small traditional port of Vourkari is a call for yachts with a vibrant selection of tavernas, shops, art galleries, and bars within walking distance. The Villa has been lovingly constructed in a traditional Cycladic style and is built on 3 levels using natural materials. It has stunning sea views from the large wraparound terraces that surround the villa. The villa is ideal for families and can accommodate 5 to 8 people. It has five air-conditioned bedrooms; three bathrooms, a well-equipped kitchen with brand new appliances, TV, DVD, Wi-Fi, and a laundry room with a brand new washing machine and a drier. The guest suite is on the top floor that includes two adjacent bedrooms with a queen size bed, a pull out queen size sofa, and en suite bathroom. Three steps below is the second level, an open-plan that comprises the lounge area, separate dining area, and a fully equipped kitchen. Vourkari, Kea: The little harbor of Vourkari is a 10 – 15-minute walk from the house and a delightful place popular with the yachting crowd. Although there is no beach in Vourkari itself, the lovely sandy beach at Yialiskari with its recommended beach taverna is less than a 15-minute walk away. Vourkari has quite a buzzy nightlife and there are several good tavernas and a couple of trendy bars. There is also a mini-market and a couple of arts and crafts shops. Otzias Bay, Korissia, Ioulis: Otzias Bay and Korissia are only a ten minute drive from the house (there is a local bus service) and the pretty island capital Ioulis is a further 15 minutes up the mountain (there is a local bus service). The Otzias Bay has a long stretched sandy beach with a lagoon section that makes it ideal for swimming for families with small children. Unlike others, Kea remains a quaint, low profile, rugged island, with few tourists, and an abundance of pristine beaches, beautiful blue-green waters, and ancient cobblestone marked footpaths, bird-watching nature reserves, few hotels and mostly, privately owned houses. Seasonally or permanently, to relax and enjoy, Kea boasts known names of the Greek and international jet-set in business, law, science, and art, as it appeals to the discerning visitor who seeks tranquility, authenticity and a genuinely Aegean environment. My mother comes from the island of Kea. I live in New York City with my wife Francine, our two young boys Angelo and Alex 11 and 14 years of age. My oldest son Jason and his wife Ligia had two children, a boy named Seth and a girl named Mina, 3 and 1 years of age turning my wife and me into grandparents. I'm a University Professor in the field of Economics and International Trade and my wife is an Anthropologist and Women's Studies specialist. We built the house in Kea to be able to reunite our dispersed family to the land of our parents and grandparents and we are very happy when we also share it with our guests. Building a house in this particular location had been a persistent and enduring dream since my teenage year where we used to spend our summer vacations. From the terrace, balconies, living room and bedroom windows, there are spectacular views of the major ports and the Aegean sea. The terrain where the house is situated is protected from the Aegean winds and the house is in close proximity to the sandy beaches and the major ports. The house is situated in the most expensive real estate piece of the island. It has spectacular views of the Aegean sea and the ports of Vourkari and Korissia and is in close proximity to the nearby sandy beaches and the major ports. Our three fig trees provide their delicious fruit to our guests during the month of July and August. Bedroom 2 (guest suit), on the top level, can accommodate up to 4 people. It has a private bathroom with a shower a private courtyard with sea views and an outside shower. Bedroom 1 (master bedroom), on the third level, has a private bathroom with a bathtub, a shower, and a small window overlooking the surrounding hills. Bedrooms 3 and 4, on the third level, share a bathroom with a shower. The villa is very well insulated and ventilated, making air-conditioning unnecessary during even the hottest days of the summer. Nevertheless, several stand-up fans are provided as well. All bedrooms are equipped with mosquito nets. The villa was every thing that the description said it would be and loads more. There were eight of us (Two families with teenagers and young adults) staying at the villa and we had the most memorable holiday for some time. The owner was very helpful and provided us with all necessary info for getting from Athens to Kea. Emails were promptly replied too and any queries were promptly answered. We arrived at the port of Kea from Lavrio having hired a car at the Airport. We were greeted by the housekeeper who was most friendly and guided us to the villa. On arrival we were welcomed by the house keeper who took us through the villa and gave us lots of information about the island. The big fridge in the kitchen was packed with water and a few cans of beer which was greatly appreciated. Kea is a wonderful island as yet it seems undiscovered by the maddening crowds. Some of us went to different beaches every day and some stayed in beaches close by. But where ever we went the pace was relaxed and always smiling friendly people to meet. The villa itself is located in a quiet area but close to local taverns. It is a beautiful dwelling made with local stones blending into its natural surroundings. It is surrounded with large terraces leading onto the garden around it. The views are breath taking and we spent many happy hours socialising on the terraces overlooking the main bays of the island. There was ample room for all of us and the villa was furnished to a high standard. We enjoyed the Tavern in Otsias where we spent lazy afternoons making friends with the locals and tourists. Ennea Kores in Vourkari is very close and you can dine on the beach where the fish is always fresh! The bars and cafes of Vourkari nearby are relaxed and suitable for all ages. We were never short of finding a good place to eat and relax. We all fondly remember our holiday at Villa Kea. We will definitely go back and have recommended it to all friends and family. We (a party of 6 single adults) spent 3 nights in this very well located villa and had a wonderful time. Very convenient location, great view, homy atmosphere, good value for money. We have already recommended the villa to other friends. Excellent customer service by both the owner and the local representative. Nearby taverna 9 kores is great. The place was clean, however some minor maintenance could be considered by the owner. We were very happy we could accommodate our guests in a very short notice and very gratified to read they had a wonderful time in Villa Kea and on the island. My husband and I had an excellent vacation in this villa. We were greeted at the port, taken to the villa and were shown extra care by the filled fridge and water. The location is wonderful and it is so nice and quiet. The sea view is serene as we spent many days relaxing on the balcony. The villa itself is so beautiful, clean, well-maintained, modern, cozy and feels like home. It was so comfortable just to relax. It is also close to nice restaurants. We definitely recommend this villa for others to have a wonderful stay. It is always our greatest reward to know our guests had a wonderful time, and that Villa Kea will be part of their enjoyable and lasting memories. 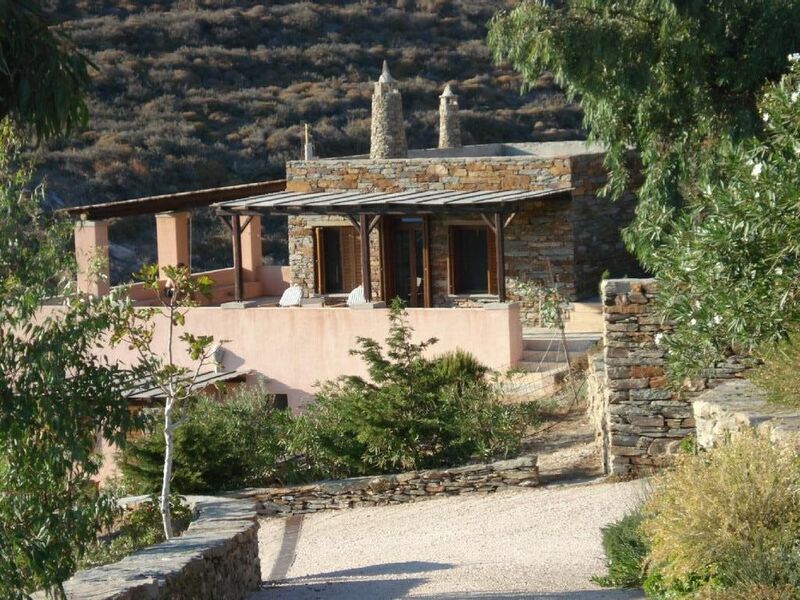 We had a wonderful time in Kea and felt very much at home in 'our' villa. The reception at the port as well as the filled fridge, bottles of water etc. made us feel very welcomed. The house is very cosy, clean and has a fantastic view from the huge terasses around the house. It is the perfect place for families or like us, for a group of friends! Thank you very much for this great week in Kea. I was thrilled to read of the wonderful time a “family of friends” had in our house on the Island of Kea. Zeus, the god of hospitality in ancient Greece, would have been encouraged to read that hospitality in modern Greece is very much alive. The Villa is situated on a 1-acre mountainside location with spectacular views of sunsets over the Aegean Sea. While the nearest village and beach are accessible by foot, (village of Vourkari is 15-minute walk and the Yialiskari beach is 20 minutes, I would recommend renting a car. From the Athens International airport, it is a 30-45 minute ride to the port of Lavrion where the ferry leaves for Kea. The boat ride is close to 50 minutes and you can get a detailed schedule of departures and arrivals by calling + 30-22920-25249. There are several tavernas within walking distance from the house with excellent (catch of the day) seafood and other traditional Greek dishes. There is a small supermarket in Vourkari, in close proximity to the Villa and two large supermarkets one in the main port of Korissia which is a 10 minute drive (approximately 2-3 kilometers) from the house and the other by Chora which is the capital of the island (approximately 8-9 kilometers). Korissia is also the main port of the island where the ferries arrive and depart. Most rates have not changed since 2008. During the week of the Greek Easter, there is a surcharge of 100-300 Euros. For more than 5 guests, there is a surcharge ranging between 100-200 Euros per additional guest based on the season.